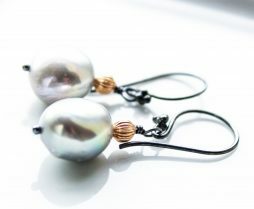 Small Dangle earrings with Freshwater Pearls. Grey pearls mixed metal earrings for her. June birthstone gifts. Bridal jewelry, bridesmaids gifts. Valentine's gifts for her. Minimalist style earrings in mixed metal – black oxidized silver ear-wires and gold filled accents. Grey freshwater baroque pearls, organic shape. Pearls are 11-12 mm big, with great metallic silver coating.